Mexico, it’s clear, will not be footing the bill for President Donald Trump’s border wall, despite what he repeatedly told his supporters on the campaign trail. Instead, unless Congress acts quickly, America’s men and women in uniform will end up paying for it, through cuts to a long list of construction projects on military bases in the United States and abroad, including several in Washington state. This week, the Pentagon delivered to Congress a 20-page list of projects that could lose money as a result of Trump’s unnecessary and irresponsible declaration of a national emergency at the border. The declaration enables the Trump administration to pay for the wall by diverting $3.6 billion from military spending and — incredibly — $2.5 billion from the National Guard’s drug interdiction efforts. Among the Washington projects at risk are an $89 million pier and maintenance facility at Naval Base Kitsap at Bangor and a $23 million maintenance facility at the Army’s Yakima Training Center. Another $126 million in Washington projects — including a critical helicopter refueling facility at Joint Base Lewis-McChord — also are on the list but could be spared, according to the Pentagon, if contracts are awarded before a Sept. 30 deadline. Trump claims he’s done more for the military than any recent occupant of the White House, but this stunt will hurt the military, which is already struggling with a $116 billion backlog of facility improvements. It will also hurt the communities that have grown up around bases. 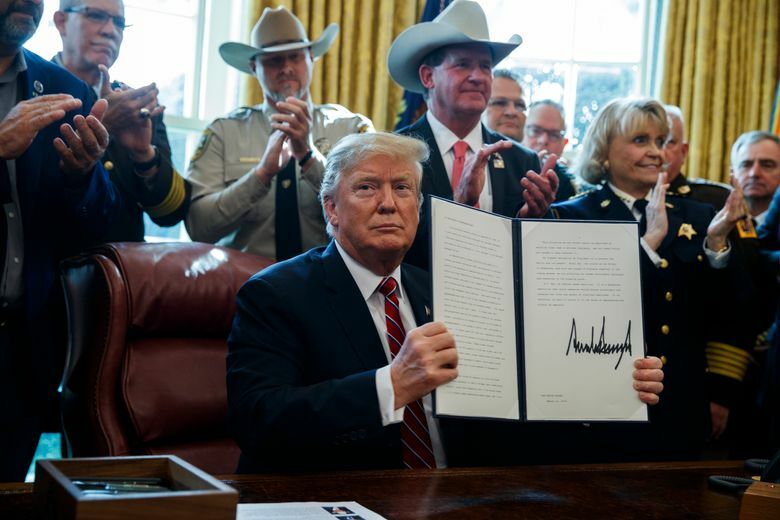 Some Republicans in the House and the Senate recently joined Democrats in overwhelmingly rejecting Trump’s emergency order. They cited concerns about setting a precedent for future presidents to circumvent congressional control over spending. Trump vetoed the bill, setting up another standoff with lawmakers. Congress should swiftly override the veto. All too often, Republicans have acquiesced to the president’s temper tantrums, excusing his irrational behavior because he achieves some of their priorities. But the danger of making such trade-offs is abundantly clear in the wall fiasco: Trump is willing to damage the military and even take money from drug interdiction efforts to get his way. There’s no national emergency at the border. There is one prompted by Trump’s veto, though, and Congress needs to end it.